Found often on vertical surfaces and RTA furniture, no other material is capable of the resolution and realism of decorative papers and foils. Photo by Kenn busch photography. all rights reserved. + What are decorative foils and lightweight papers? These materials thin paper-based decorative surfaces bonded to a smooth substrate, usually MDF. They are capable of carrying very high-fidelity printed designs, especially woodgrains, as well as matte/gloss variations to create optical textural effects that mimic woodgrain ticking and similar textures. Because they are so thin they’re easy to profile wrap around shapes moulded into substrate edges. You’ll find them often on mass-produced picture frames, in woodgrains and solid colors in various gloss levels. 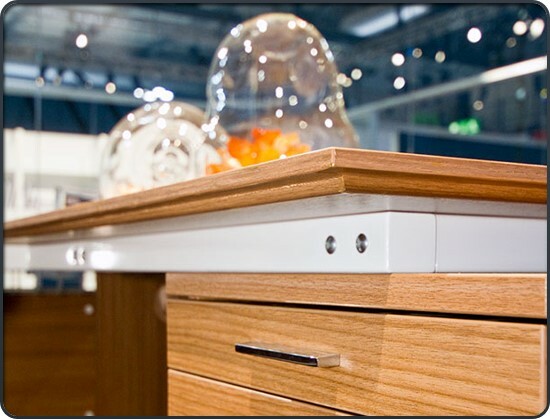 They are widely used in cabinet interiors, drawer sides and bottoms, shelves, closet systems and home office and RTA furniture. You’ll also often find them on the contoured edges of TFL panels with colors and prints that match the surface design. Foils and lightweight papers differ in the way they carry the resins that provide durability and optical effects. In foils, the resins are in the paper; in foils, the resins are applied to the top. Both are glued to a substrate. + Why foils and lightweight papers? Economical: These materials are lower cost than most other decorative surfaces, yet they can be printed with extremely realistic designs, usually woodgrains. This makes them an excellent more-durable alternative to solid wood and veneers, especially in vertical applications. Reproducible designs: Unlike woods and veneers, the color and character of foils and lightweight papers can be exactly reproduced year after year. This means you can replace a damaged wall panel years after the original installation and still maintain the visual harmony of the space. This is impossible to do with wood; its color changes over time, and you’ll never find a match for the original grain character. 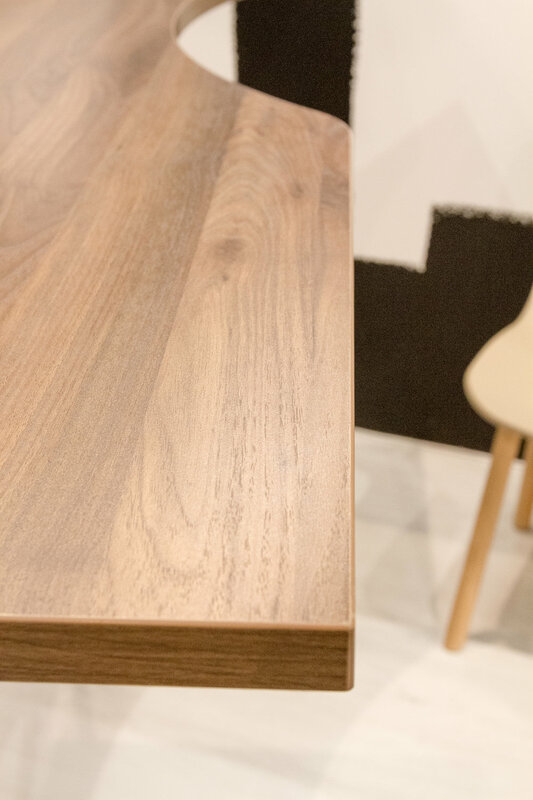 Extremely realistic woodgrains: Foils and lightweight papers are a perfect responsible alternative to fragile and rare wood veneers. With optical effects that mimic woodgrain texture, even veteran woodworkers find it difficult to tell the difference between wood and these paper overlays. + Where are foils and lightweight papers used? Commercial: Because they’re able to carry such high-fidelity woodgrain designs, foils and lightweight papers are a great option for flat wall panels and architectural mouldings and trim. 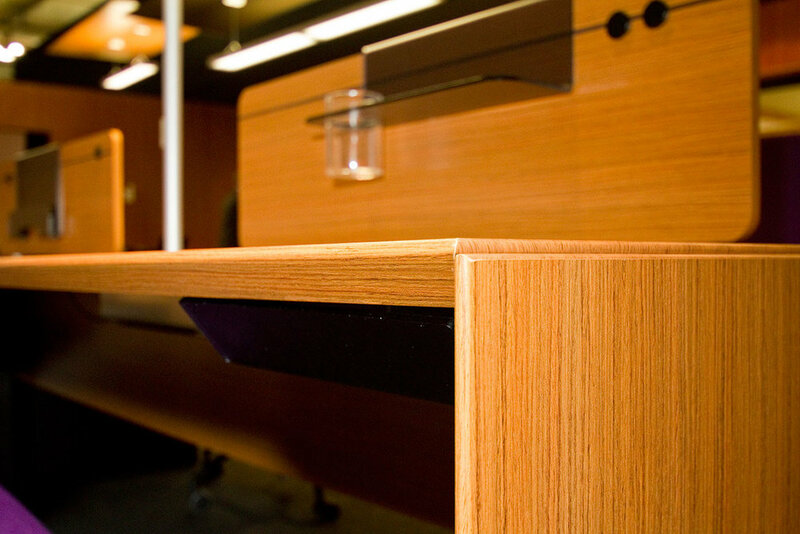 Office furniture manufacturers often use them on contoured component edges in designs that match a TFL or HPL work surface. They’re also found on the exteriors of hotel armoires, and on shelving and cabinet interiors in just about every setting. Residential: Entertainment centers, home office furniture, bookshelves, bedroom furniture, closet systems, drawers and cabinet doors, moulding and trim…anywhere you might see veneered or painted wood components. Flexible enough to be wrapped into linear contours and radiuses. Foils and lightweight papers are very thin, requiring substrates like MDF with smooth surfaces to prevent the telegraphing of surface imperfections. Enhanced wear-, chemical- and moisture-resistant formulations are available. Impact resistance depends on the density of the core. Surface Visuals: Foils and lightweight papers can be printed with very high-fidelity designs, making them an excellent alternative to wood and veneers. They are also often used in solid colors to mimic painted or lacquered wood. Textures: These are very thin materials, so the standard mechanical embossing we see in TFL and HPL isn’t an option. 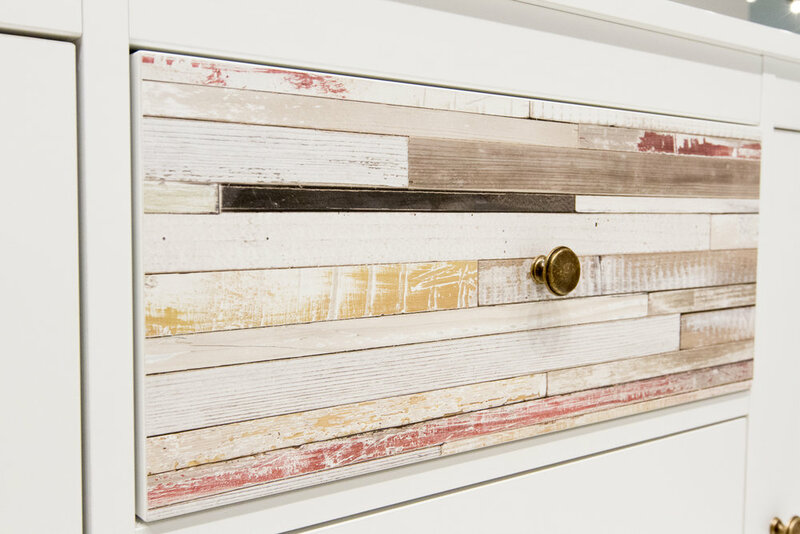 Instead, woodgrain and other textural effects are achieved by printing small areas with “inks” that resist the subsequent topcoat application, creating matte/gloss variations. These effects can be very convincing, closely resembling finished wood and veneer. Standard finishes from matte to high gloss are also offered. Shapes/Form: Foils and lightweight papers are generally used on flat, rectangular panels and narrow moulded components. They are used in combination to create five-piece cabinet doors and architectural panels. Profile-wrapped mouldings form very tight, almost invisible seams when miter-cut for products like picture frames. Edges: The same material can be applied to a panel’s face and edges. Furniture manufacturers often make profile-wrapped mouldings from the same papers and glue them to the panel edges. Foils and lightweight papers are often used to wrap the contoured edges of panels with TFL surfaces. Matching Materials: Foils and lightweight papers are often matched with TFL, HPL and 3DL to maintain design harmony between high- and low-wear areas of a project – vertical and horizontal surfaces, cabinet exteriors and interiors, and work-surface tops and edges. Decorative foils and lightweight papers are glued to substrates with special laminating machines – roll laminators for flat components, profile wrappers for mouldings, trim, picture frames, etc. Several different adhesive systems may be used. Some papers may be supplied with a hotmelt adhesive already applied, ready for use in hot-roll laminating equipment. Decorative foils and lightweight papers are a convincing alternative to fragile and rare wood veneers in high-square-footage applications like wall panels and architectural moulding. EQ 4.4: Low-Emitting Materials – North composite wood panels meet CARB II requirements The material’s realistic woodgrain visuals and textures allow designers to use replace fragile and rare woods and veneers with more durable, design-consistent and cost-effective 3DL surfaces.